How much is Bob Probert Worth? Bob Probert net worth: Bob Probert was a Canadian professional hockey player who had a net worth of $5 million. Bob Probert was born in Windsor, Ontario, Canada in June 1965. He was a left winger who shot left handed. Probert played for Windsor Club 240 and then for the Brantford Alexanders of the OHL. He was drafted #46 by the Detroit Red Wings in the 1983 National Hockey League Draft. Probert played for the Red Wings from 1985 to 1994 and then for the Chicago Blackhawks from 1995 to 2002. He was best known for being a fighter and enforcer and was one half of the "Bruise Brothers" along with Joey Kocur. Probert holds Detroit Red Wings records for career penalty minutes and penalty minutes in a season. He is also 5th all-time in NHL penalty minutes. His autobiography What a Journey It's Been was published in 2007. 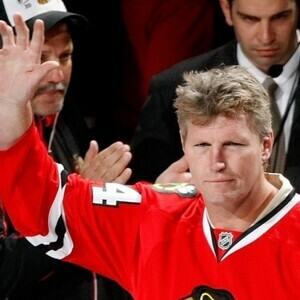 Bob Probert passed away on July 5, 2010 of a heart attack at the age of 45.